HOME PRODUCTS &AMP; SERVICES DIRECTORY OF SUPPLIERS TOTAL POWER INTERNATIONAL, INC.
Total Power has been a leading supplier of power supplies and DC/DC converters for 34 years. Since their conception in 1984 Total Power's growth and success has been a result of their ability to quickly react to their customers' needs. Total Power has manufacturing facilities in the United States, China and Taiwan and sales and support offices in the United States. Their manufacturing facilities are ISO 9001, 9002 and BABT approved. AC BRICKS: Encapsulated PCB Mount Modular Switching power supplies from 5 to 30 Watts. Units are available in commercial or medical versions. Models also come with pin or screw terminal package. Single, dual and triple outputs. AC-DC: Total Power's AC-DC Power Supplies come with Universal Input and Single, Dual and Triple Outputs. They range from 12 ~ 70 Watts and are in a Compact PCB Size . External Power Supplies: 5 ~ 130 Watt. 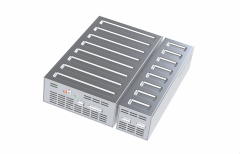 These Power Supplies come in many sizes and are available in Medical and Commercial Versions. Plug-Ins: The Compact PCI Series comes in the PCI Form Factor. Their VME Series come with 45 ~ 360 Watts. Auto-Ranging AC Input, AC – DC Single 160 Watt Output. Modular: The Modular Series are switching power supplies with modular design that consists of two stages: front-end PFC and output modules. Using ZVS (Zero Voltage Switching) technology to realize the PFC, the line input is rectified into high DC voltage (around 390VDC) by the front-end PFC stage, and then the DC output modules will transfer the operating voltage into all kinds of DC output voltages. Total Power also provides innovative medical grade products as well as full custom design units. View More Product Announcements from Total Power International, Inc.